Could it be that we’re hit with images like THESE from the media EVERYWHERE we look? 91% is ALOT, and I’d like to start changing that! I’d say most women during their lifetime feel some kind of pressure about how she’s “suppose to look” to be accepted or feel worthy (myself included). And if you think that thin, “normal weight”, healthy, models, &/or fit people are exempt from this type of societal pressure…THINK AGAIN! Yep, the dieting culture and mentality grabs onto you with a tight hold, and doesn’t want to let anyone go! No wonder the health & fitness process isn’t enjoyable for most. 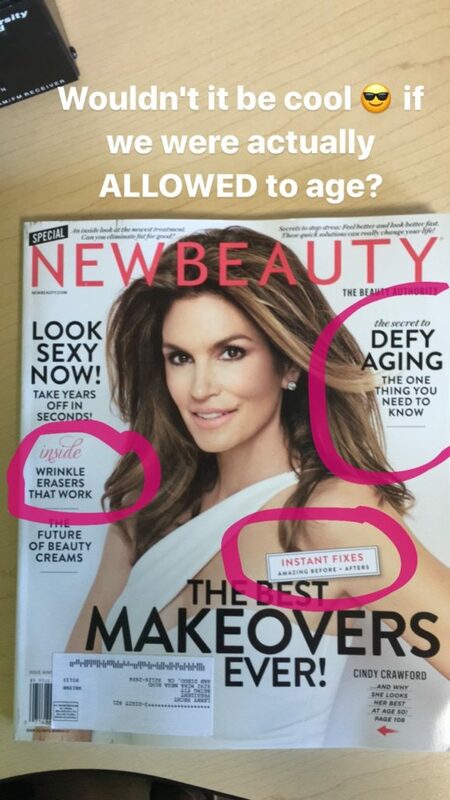 A lot of this pressure is because we live in a fat phobic and anti-aging society. We think with enough self-criticism we may be able to stay in control and beat the inevitable…which is death (no one’s getting out alive BTW)…looking smoking hot the entire time! The fact of life is that our bodies are going to change throughout our lifespan. The more we can accept our bodies and show compassion to ourselves throughout our journey, the more enjoyable eating healthy and exercising can be, and the more energy we’ll have to devote to things that really matter throughout our lifespan. The goal is to always be learning, growing, and to treat ourselves better! Increasing our awareness around our self-talk and the media being presented around us, gives us a choice. A choice to start a different conversation. A CONVERSATION OF COMPASSION, ACCEPTANCE, AND SELF-LOVE! YOU up for that type of conversation? If so, join Alicia and I for our Body Love Workshop! If you’re a local woman in San Diego, get more details about what we’ll be covering and save your spot by clicking here —> http://bit.ly/2oCXMZ9. In the mean time, be mindful of the different types of media you are choosing to consume and how it may be affecting the way you feel about yourself. It’s okay to unfollow certain fashion blogs, diet and detox pages, and fitness models, especially if looking at those images make you feel bad about yourself. ← Do You Look “Fit”?